Mitchell's beautiful map featuring the Iberian peninsula. 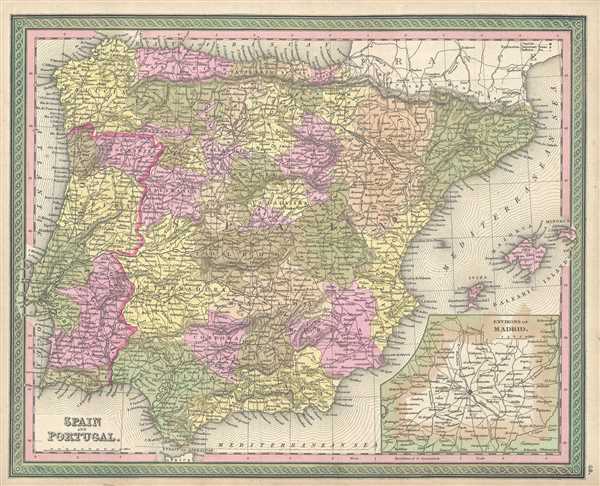 This is a fine example of S. A. Mitchell's 1849 map of Spain and Portugal. Political and topographical features are noted and color coded with elevation rendered by hachure. An inset map of the Environs of Madrid is featured in the map's lower right quadrant. Includes the Balearic Islands: Ibiza, Majorca and Minorca.